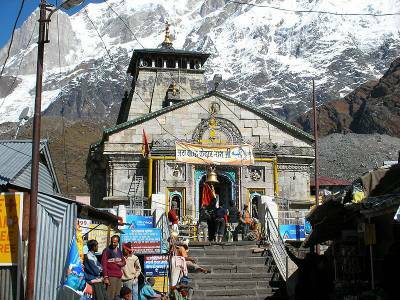 Kedarnath is a Hindu temple dedicated to Lord Shiva. It is one of the holiest pilgrim centers in northern India. The temple was built by Pandavas and revived by Adi Sankaracharya and is a one of the twelve Jyotirlingas, the holiest Hindu shrines of Shiva. 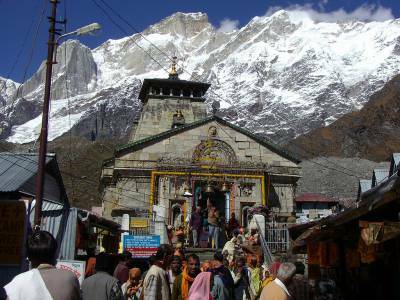 The Kedarnath temple is one of the four major sites in "Chota Char Dham" pilgrimage of Uttarakhand State. Kedarnath temple also a part of Panch Kedar and comes in first number of Panch Kedars circuit in uttarakhand. The Lord Shankar here in the form of the shape of the back of Bull (hump). Kedarnath Built between the 9th and 11th century, it has retained its indelible unity with the austere Kedar Parvat in the distance. That this was accomplished ten centuries ago and at an altitude of over 3,500 meters above sea level in this snow-clad region is astonishing. The architects of temple that time look great, beautiful and architecturally stable also, after the flooding of 2013, a few cracks appeared in the left and front walls. A door was damaged, but the temple stands firm – proof of the technical rigor of the architects who built it. According to the mythology when Pandavas were searching for lord Shiva to ask for his forgiveness for having killed their kith and kins in the Mahabharata war, Shiva tried eluding them for a while. He took the form of a Bull and jumped down on the himalayas and subsumed in earth. Place where the hump of the bull can be seen is Kedarnath. Other parts of Shiva like his heart and hands, his locks, his Nabhi and his face are worshipped in 5 different places in Himalayas and collectively they are known as Panch Kedar. Out of these 5, Kedarnath is the PRATHAM KEDAR hence most important. The Kedarnath temple was supposed to be built by the Pandavas themselves and therefore the Sabha Mandap has the idols of Pandavas along with Kunti, Draupadi and Shree Krishna. Vishnu and Laxmi are also present with Nandi Bull. 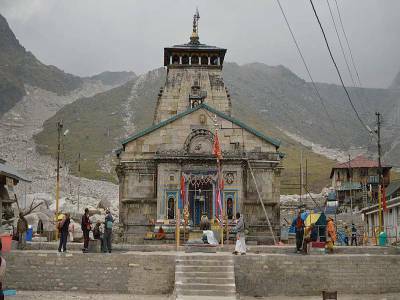 The holiest Temple of "Kedarnath Jyotirlinga" is situated about 15-16 kms trek from Gauri kund. Try to reach early & start early around 4-5 am to avoid big rush. 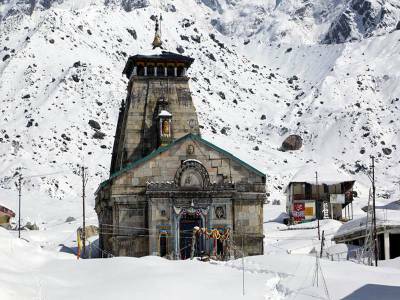 During the winter season, due to heavy snowfall, the Temple is closed and no one stays in Kedarnath for six months (November to April). 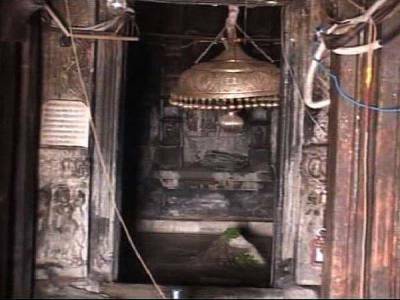 The Palki with the utsava murti of Lord Kedarnath is transferred to the Omkareshwar Temple, Ukhimath, Rudraprayag. Travelers can book online registration for Kedarnath Jyotirlinga darshan (100 INR) and get a bio-metric registration pass at Rishikesh bus stand. Travelers can also avail a VIP pass facility at 2100 INR per person to avoid the line. The Helicopter Service also available from guptkashi and journey from Helicopter It will take about 8-10 mins to reach. Accessibility: about 75 km drive from Rudrapayag, the closest town to Kedarnath Temple. 213 kms from Rishikesh, 232 kms from Haridwar, 255 kms from Dehradun, 450 kms from delhi, 216 kms from Rishikesh railway station, 238 kms from the nearest airport. Accommodation: There are a couples of Places to stay in and around Gaurikund. Govt geuest house, tent and Budget private hotels are available at Gaurikund. Winter is the best time to visit Kedarnath. Less Crowed. you can easily perform your pooja at temple. Due to less no of people around you can easily visit every part of temple and can spend time to feel presence of lord Shiva around you. Get quick answers from travelers who visit to Kedarnath Jyotirlinga.